Date : 1522- 1535 (Published) Vienna. Dimensions : 11 x 18 inches (28 cm x 45.7 cm). This magnificent trapezoidal Ptolemaic woodcut map by Laurent Fries features the northwest corner of Africa, which is often referred to as the Maghreb (meaning western in Arabic), and includes Morocco, Mauritania, the Western Sahara, Algeria and the western edge of Libya. The famed Pillars of Hercules of antiquity are depicted on either side of the Straits of Gibraltar. Aside from a portion of southwestern Spain, the northern portion of the map is occupied primarily by the Mediterranean Sea. Inland in Africa, Fries depicts and names towns and cities and geological features of which there was knowledge in his day, and the detail is impressive. The great Atlas Mountains of northern Africa, which extend some 1,500 miles across NW Africa, Morocco, Algeria and Tunisia, are shown creating a natural border which separates the Mediterranean coastline from the Sahara Desert. The Atlas Mountains are actually a series of ranges with a wide variety of terrain, climate and wildlife. The mountains are riven with canyons and ravines, and have been home to the Berbers for untold millennia. 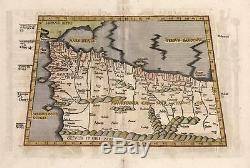 This hand colored woodcut map is one of the earliest known depictions of northern Africa. Fries often worked with Michael Servetus, who was burned at the stake for having published a map which described the Holy Land as barren. Calvin himself thundered at Servetus trial for blasphemy that by stating that the Holy Land was barren, Servetus directly and blasphemously contradicted Moses, who in Exodus 3:7-8 stated that the Holy Land was flowing with milk and honey. Condition: This map is in B condition. Centerfold separation has been repaired with archival material on the verso. Images and print from the verso are visible in places. The item "1522 1535 Tabula I Aphricae" is in sale since Tuesday, July 31, 2018. This item is in the category "Antiques\Maps, Atlases & Globes\Africa Maps". The seller is "hjb-antiquemaps" and is located in Chicago, Illinois.